The early detection of fire or overheating conditions is what the Kidde AlarmLine Linear Heat Detector has been built for. This detector works by detecting changes in temperature in localised areas or over its entire length. 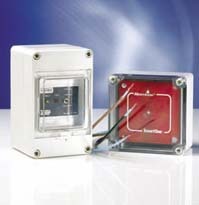 Confined areas or harsh environments is where the Kidde AlarmLine Linear Heat Detector is especially suited for, where adverse ambient conditions cause other detection devices to be unreliable or hard to use. A small diameter sensor cable and an interface module are the two major components in the system. The sensor cable is built with a negative temperature coefficient material, where a difference in temperature causes an exponential decrease in resistance of the sensor. The interface module interprets this resistance change and gives an output to a control panel once the field programmable alarm set point is exceeded. Mechanical - Allows installation at point of risk. Electrical - Compatible with all central control panels. Alarm Levels - Adjustable for different temperatures. Extrusion and Braiding options to satisfy environmental conditions and project risks. Fault signaling of open and short circuit conditions. Self restoring after fire event to 257degF (125degC). Proven superiority over point type measurement. Field adjustable: Alarm setpoint may be programmed to meet specific system requirements. Restorable: Cable does not need to be replaced after an alarm event up to 257degF (125degC). Integrating: It is not necessary to reduce sensor spacing with increased ceiling height per NFPA 72, Section 5-6.5.5.1 Exception (1). System sensitivity remains constant as ceiling height increases without reducing the spacing. Short circuit: The system will produce a trouble condition instead of a false alarm in the event of a conductor to conductor short due to damage or electrical faults. 73-117068-020 Nylon Cable Tie (pkg 100) for pipe up to 8"
73-117068-022 Master Clamp (pkg 100) for flanges to 1/2"
73-117068-023 Flange Clip (pkg 100) for flanges to 3/16"
73-117068-024 Flange Clip (pkg 100) for flanges to 1/4""